1.) If your PC's power supply unit only has free 4pin Molex plugs left, please use the enclosed 4pin Molex to SATA converter to power the card; Please make sure the power cable strand colours match each other when connecting to the power augmentation, as to avoid faulty currents. 2.) If there is no free 15pin SATA plug available in your PC, please use the enclosed 15pin to 2x 15pin SATA Y-cable. - Support UASP: 70% Faster than traditional USB 3.0, with UASP Transfer Protocol; The UASP Transfer Protocol only can accelerate read and write speed of SSD hard disk. 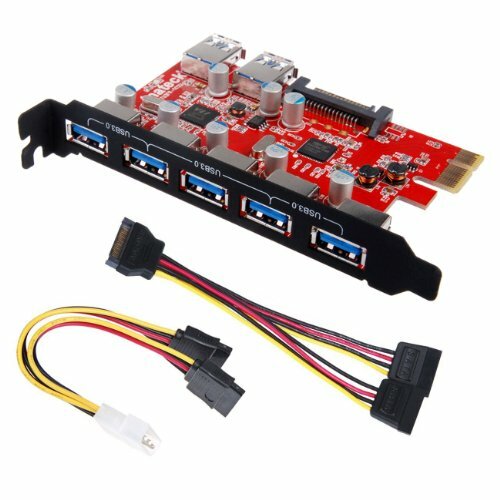 To ensure the PCI Express Card works properly, please first connect the PCI Express Card to your PC's power supply.